of the brand and showcases Triumph’s historic and modern achievements in design, engineering, racing and popular culture. unique engineering and manufacturing process and facilities. history, illustrated by three game changing activities in 2017.
of more than 63,000, with 15 new motorcycle models launched in the last two years. 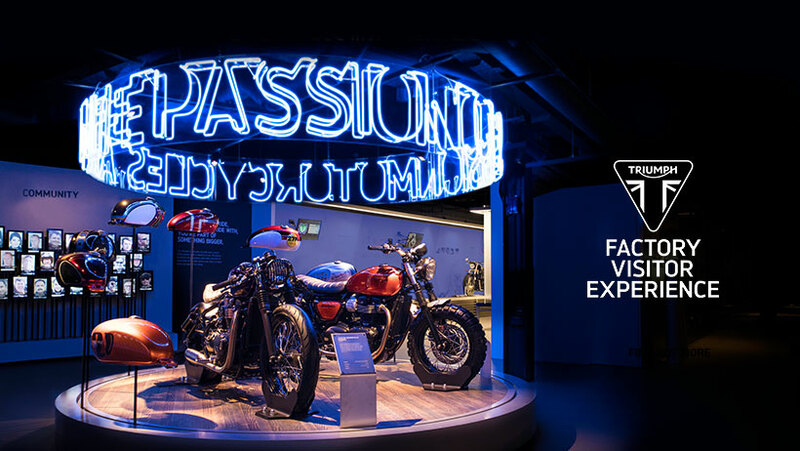 Hinckley, UK, 3 October, 2017 – Triumph Motorcycles has opened the doors to an immersive new Visitor Centre that will allow fans to go behind-the-scenes and journey through a 115 years of motorcycling excellence. to visit and will showcase an exclusive collection of never-before-seen exhibits centred around the design, engineering and manufacture of Triumph’s most iconic models. – the Triumph Bonneville on which Steve McQueen attempted to jump the border fence in The Great Escape, which has been lovingly restored to working order. Elsewhere, the two-wheeled stars from road, track and screen include the very first Triumph No1 from 1902, the Speed Triple ridden by Tom Cruise in Mission Impossible 2 and the latest race engine prototype for the 2019 Moto2TM championship. “We are very proud and excited to be able to invite Triumph and motorcycling fans from around the world to come and experience our brand first-hand, here at the factory where every Triumph starts its life. the home of the brand – built by riders, for riders. Visitors to the new centre can also sample the Triumph 1902 café, which offers freshly-ground coffee, a comprehensive menu and free Wi-Fi in unique surroundings – the perfect place to top up the tank before the journey home. Admission to the Visitor Centre is free of charge, while the 90-minute factory tour can be booked online in advance for £15 per person. The experience is open to the public from 1 November and tickets can be purchased from today.